In recent years, health and nutrition have increasingly become key focus on people’s minds. Food blog Themes have recently become very popular. Some famous bloggers have even published their own books, started their own food channels, and have been featured in magazines! Food blogging, however, is not an easy task. It requires experimentation, finding the right recipes, taking beautiful pictures, testing the recipe out and choosing the perfect settings. This is just to get one recipe out on the blog. There is a lot more that goes into blogging otherwise as well. Here are some of the best, beautifully crafted, premium food blog themes that you may want to explore. If you’re just starting out or want to test the waters before committing to one of these, you can try out some great free food blog themes. 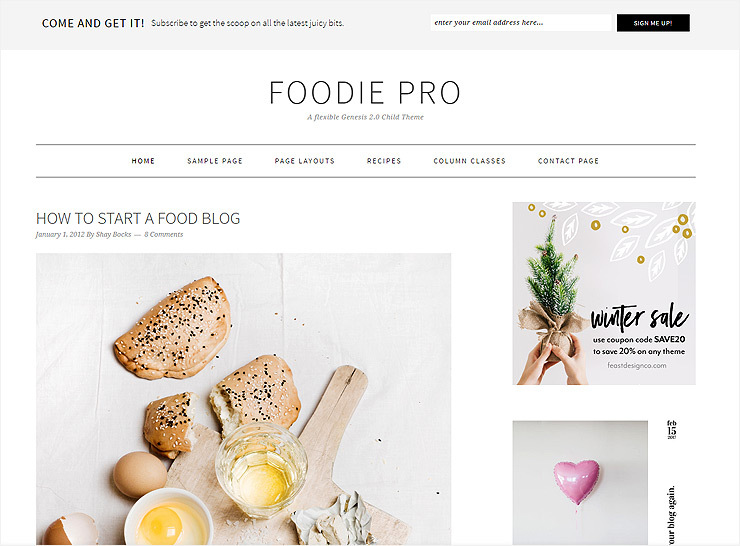 These premium, feature packed themes are geared towards bloggers of all types – whether you’re a hobbyist or a pro food blogger, this list is for you. Showcasing your choice of recipes should not be a difficult even if the preparation of that recipe and blog post is! 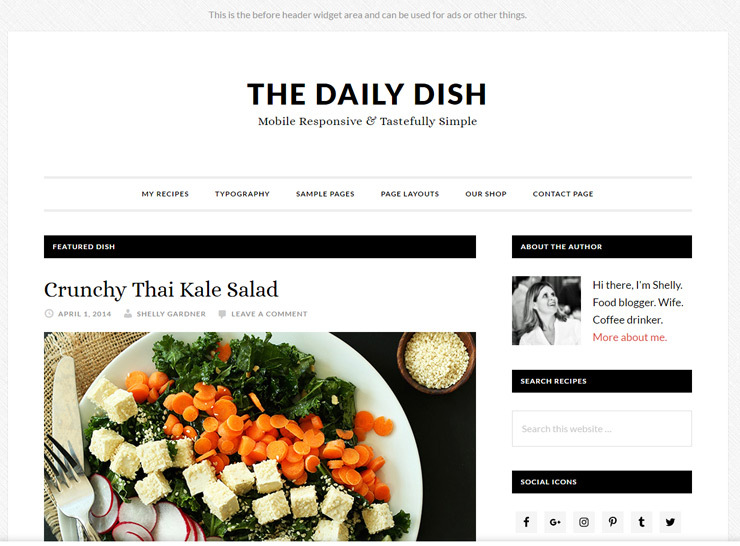 All these premium food blogging themes themes require a self-hosted WordPress site. 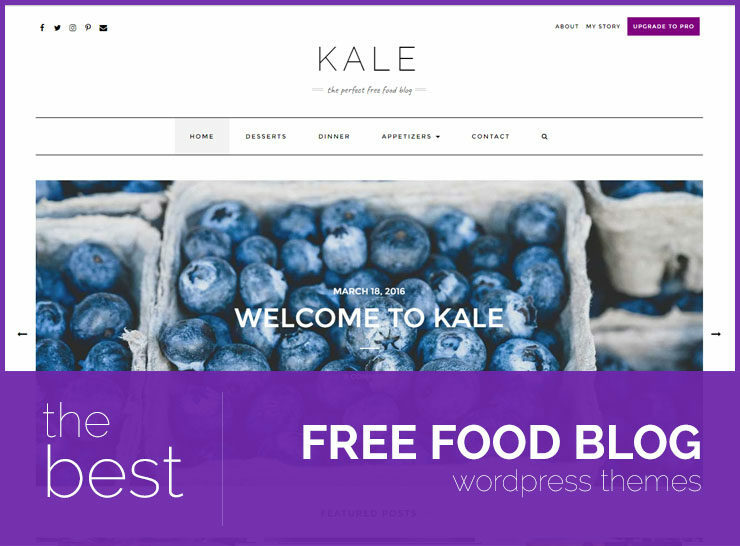 Kale Pro is an aesthetically pleasing, feature rich food blog theme. 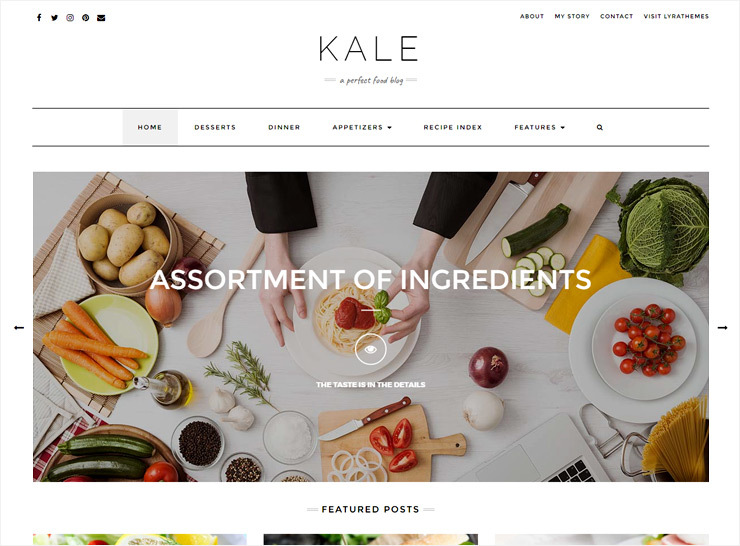 It is one of the best, latest, and most popular food blog themes on the market today. Continuously evolving and making itself even better, this is the perfect theme for those who interested in running their own food blog, or starting a lifestyle or personal blog. It is especially suited for food bloggers as it has some great recipe sharing features already built-in! It is quite minimalist in nature, and boasts an inviting and charismatic design. The beautiful front page has a slide or banner option, featured posts, a highlight post, and selected posts from a category of your choice. This gives you several options to play with and create a visually appealing display of your ultimate recipe book. There is a built-in ad placement option, as well as recipe shortcode builder, and a recipe index template. The theme also supports video format for blog posts. This theme has several sidebar widget options and three blog feed display options, giving this food blog theme flexibility and versatility in its setup. 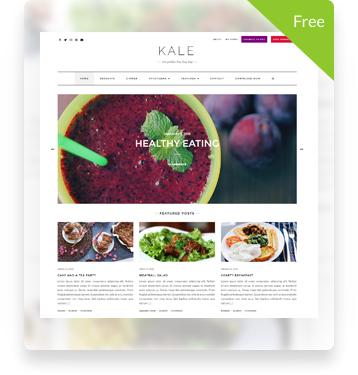 Some of the great plugins you integrate well with Kale Pro are: Recent Posts Widgets with Thumbnails, WP Instagram Widget, and the newsletter plugins MailChimp and MailPoet. 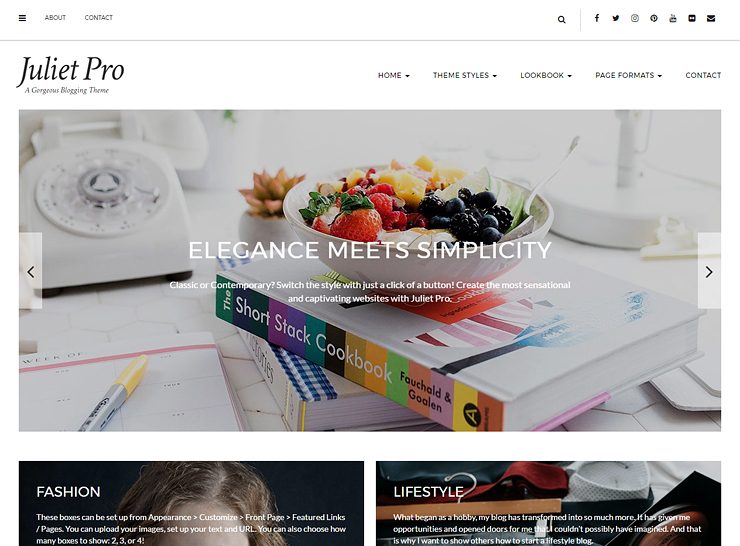 Juliet Pro may not exactly stand out as a food blog theme, but gives a very fresh and feminine vibe. It stands out from the crowd because of its clutter free, feminine and breathtaking layout. 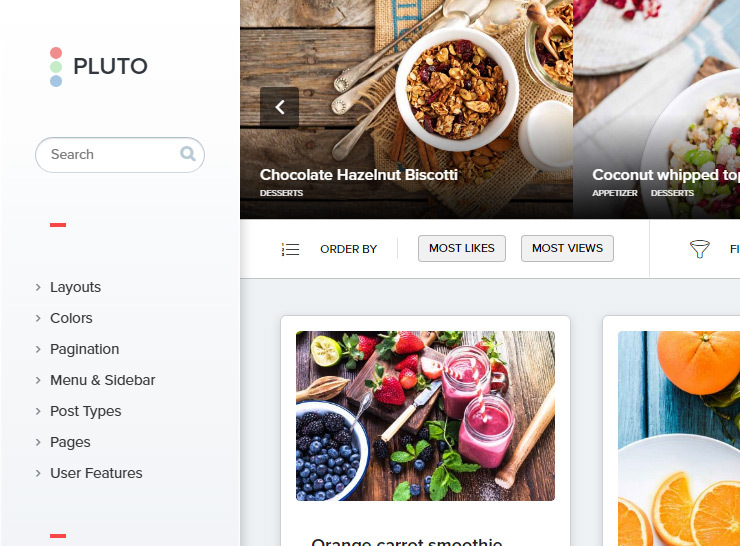 Juliet Pro is jam packed with features and has the flexibility to be molded into a great, beautiful looking food blog. Once you view the demo for Juliet Pro, you would realize the versatility of this theme. Off Canvas menu, a beautiful blog news feed, fancy scrollbar, Instagram news feed, optional sticky navigation, and unlimited color options are just some of the great features available. It integrates well with JetPack so you can use its social media sharing options. The theme comes with multiple slide options, where you can also display Vimeo or YouTube videos as slides. Juliet Pro has the flexibility to be a great and aesthetically pleasing food blog. 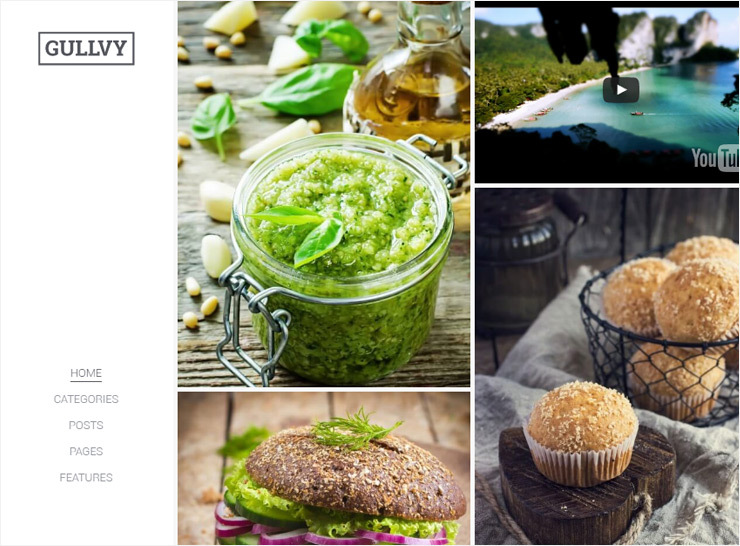 This responsive and multipurpose theme is ideal as a food blog theme because the layout carefully balances text with space for pictures and videos. Sprout and Spoon is one of the best selling, feature packed food blog themes on the market today. Look no further if you are looking for a fresh and visually appealing blogging theme. Sprout & Spoon is ideal for your recipe blog! It doesn’t stop there, if you’re running your own DIY blog or a lifestyle blog, Sprout & Spoon can easily be cultivated to cater to your specific niche. The theme offers seven blog feed layouts to choose from. It also showcases a larger than life featured area to at the top of the home page, giving your blog a fresh and crisp look. Its most note worthy feature is the custom recipe card that allows you to post and print recipes with ease. Sprout and Spoon comes with several widget areas, many of them suitable for newsletter and ads. It also has several custom widgets, including About Me, Social Icons, Latest Posts, Ad, Facebook, and Promo Box widgets. Along with the recipe card functionality, the flexible recipe index feature is extremely useful for food bloggers. 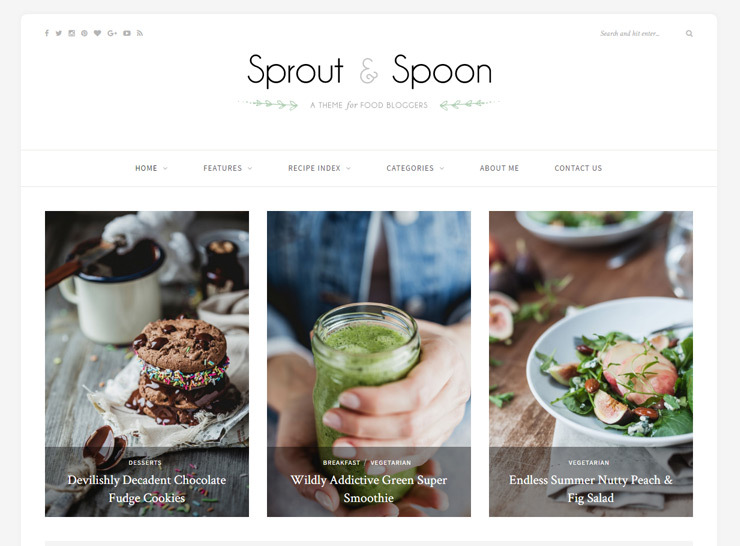 We love the crisp, elegant, and clean Sprout & Spoon theme which is indeed a great choice to set up a food, recipe, or personal blog. Soledad is a singularly exceptional blogging theme, offering a plethora of options for layout and design customization. 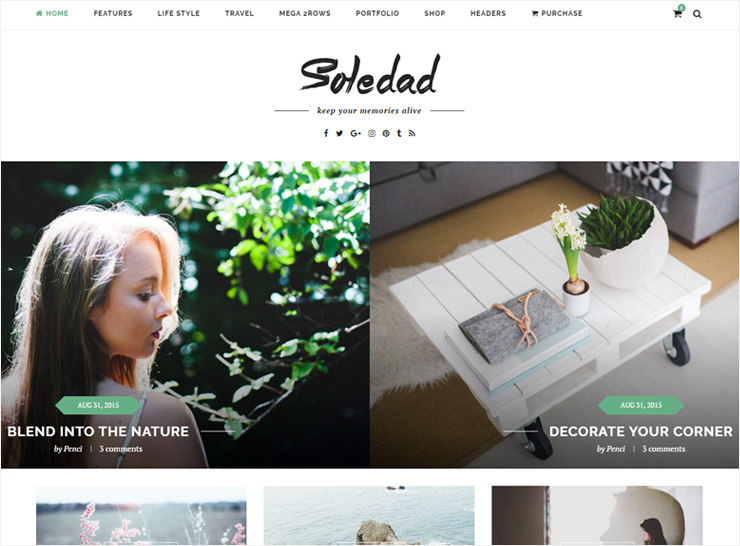 With over 300 slider and blog layout combinations, Soledad does not disappoint. There are many demos to choose your ideal look from. Soledad is a thoroughly thought out theme, with a myriad of features that help you set up a unique blog. It has been professionally designed and very carefully crafted to give you all the tools needed to create a blog or magazine website. Soledad gives you the option to set up your site using the included Visual Composer or the native WordPress customizer. Fully integrated with WooCommerce, Soledad is ready to start selling right out the box. Other features include RTL support, amazing galleries, video backgrounds, Mega Menu integration, and 9 slider options. Multiple header and article layouts make it easy for your to make your blog match your personality and needs. Soledad stands out from all the other food blog themes because of its versatility, ease of use, and extreme customization ability. The MH Magazine WordPress Theme is a robust and highly flexible theme that can be used for a plethora of different purposes. It is a multi functional magazine theme that is jam packed with features that enable you to create a stunning and professional news or magazine website on a multitude of topics, such as food, fashion, travel, sports, music, news, etc. The MH Magazine D5 demo stands out among the many food blog themes since it is in a magazine format with plenty of spots to place ads and highlight different content in a variety of ways. It is not the regular food blog theme, and supports a fully widgetized front page allowing to make the best use of that space. 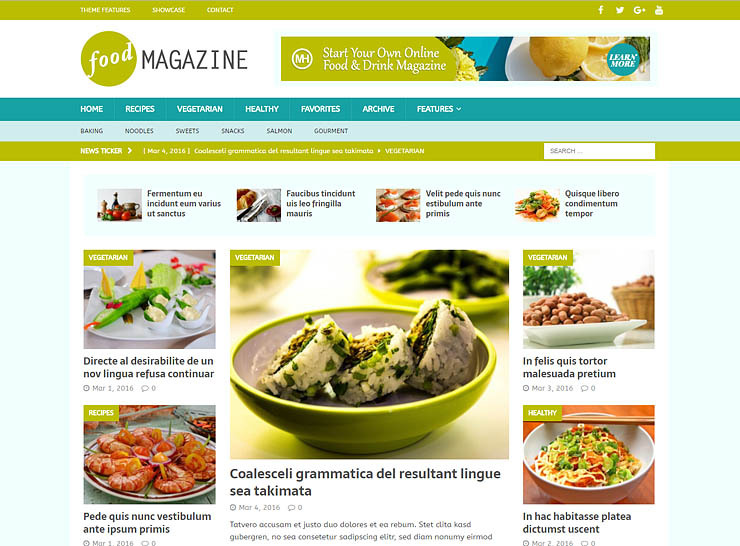 This premium food magazine theme comes with options for a boxed or wide layout, custom colors, multiple sidebars, widgetized areas to display banners and ads to help monetize the website, custom menus, and content sliders. Gullvy offers a stylish, engaging, and unique layout. There are two options to suit the mood of the food blogger. A ‘light’ version, that is crisp and bright or be the ‘dark’, which can really help colorful food images stand out. The theme offers several post types, image, slideshow, video or audio; all the options you need to capture the audience’s attention. Feature videos of mouthwatering recipes being made or showcase a slideshow of your stunning, edible creations. The choice is yours! 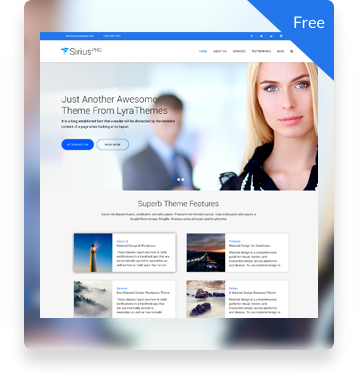 Most importantly the theme comes with an easy to use layout builder, that will have you up and running in no time. There are plentiful options for colors, fonts, social media icons, typography and you don’t need to be a technical guru to put all of this together. 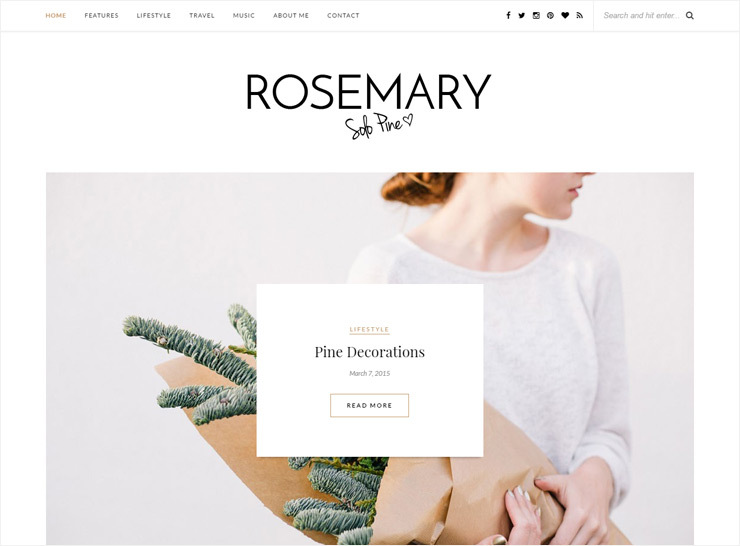 Rosemary is an elegant and eye catching theme that can be used to serve a variety of purposes. 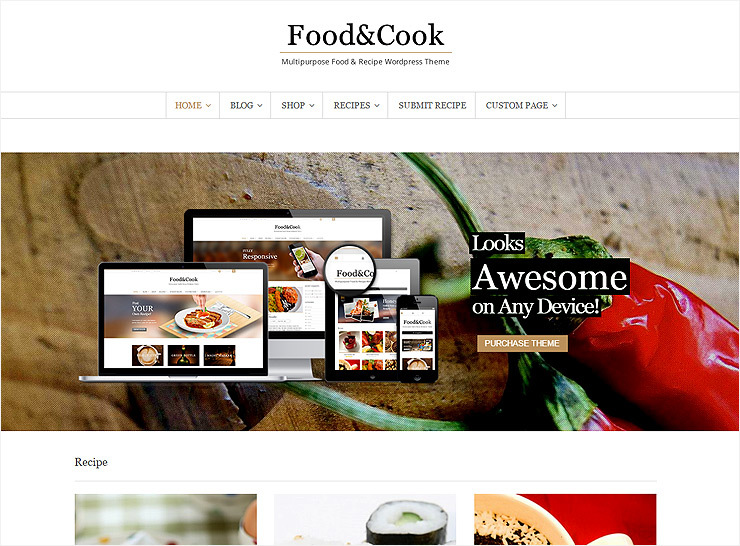 For food bloggers who need a modern and appealing design, this is the ideal theme to start with. Rosemary boasts a beautiful slider and 5 different blog feed layouts. A dedicated spot for your Instagram feed puts your social media presence front and center. The video, gallery, and music post formats make it easy to showcase your content in the most optimum way. The theme is responsive and looks great on devices of all sizes. It offers a diverse palette of beautiful colors to showcase your blog according to your own branding colors. If you’re a craft blogger, a fashion blogger, or a recipe fanatic, this theme is built with you in mind. Food and Cook is a theme that will have your readers licking their fingers for more! It has a crisp and colorful layout that can be used for a variety of purposes. The theme boasts six home page layouts, several widget areas, and many different page layouts. With many options to put your posts and products front and center, Food and Cook is the ideal theme if you’re selling online. The parallax background effect looks beautiful and gives the design a lot of depth and character. Easily embed videos from many video sharing services, allow your readers to submit their own recipes, and monetize your website by using the built-in Adsense feature. If you are new to food blogging, this is an excellent theme to start with. You can maintain your reader base and control the level of interaction the readers can have with your website. Readers may submit their own recipes or you can allow only commenting on your recipes. As you grow or are ready to start selling online, the theme offers WooCommerce integration to help you setup your own shop. 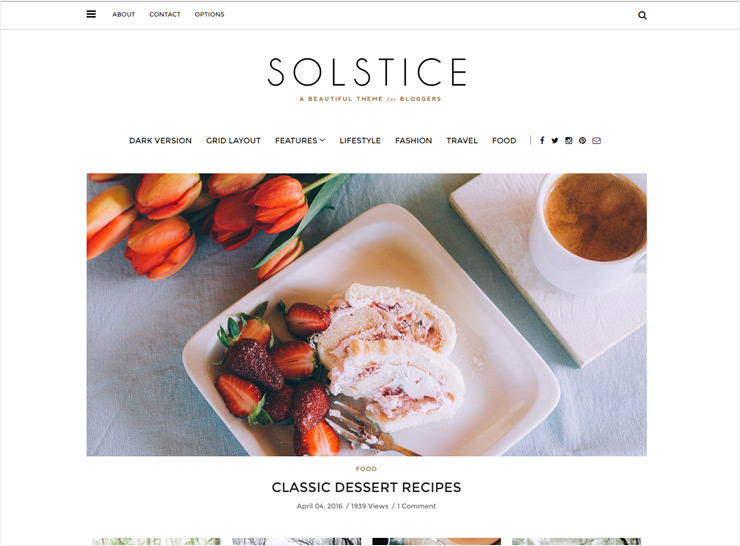 Solstice is a mega, multipurpose blogging and magazine theme. Get ready to dive into a long list of features offered by this theme. Use Solstice to create a unique and modern blog with a lot of class and character. 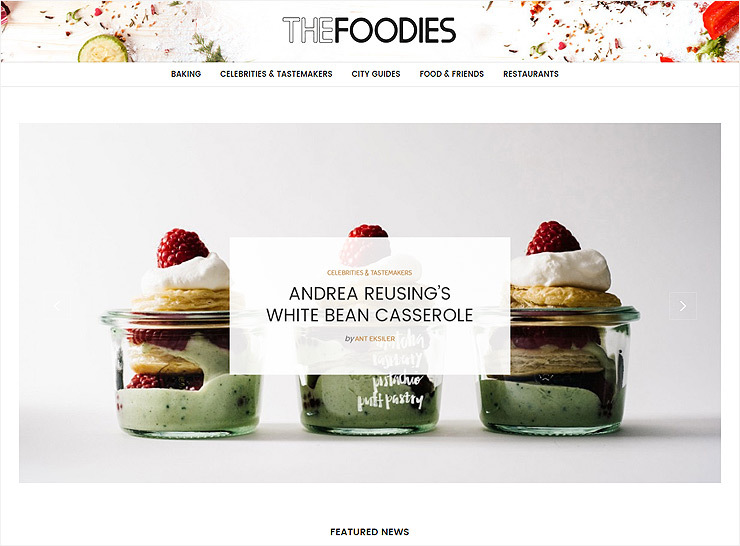 While there are many food blog themes created specifically for the purpose of sharing recipes, this theme is extremely flexible and versatile to handle all your blogging needs. This is the perfect choice for fashion, lifestyle, travel, food, craft or tech blogs, thanks to its simple design, clutter free layout and diverse color palette. Solstice comes with many custom widgets, two types of pagination options, multiple font and color options, and flexible options to showcase your social media presence. The theme also has built-in light and dark themes allowing you to choose the ideal look for your blog. The flexibility of Solstice makes it a great food blogging theme option. Voux is a mammoth of a theme with a myriad of customization options. It is a comprehensive magazine theme that has a stylish and engaging design, well thought out features. and drag and drop building capabilities. 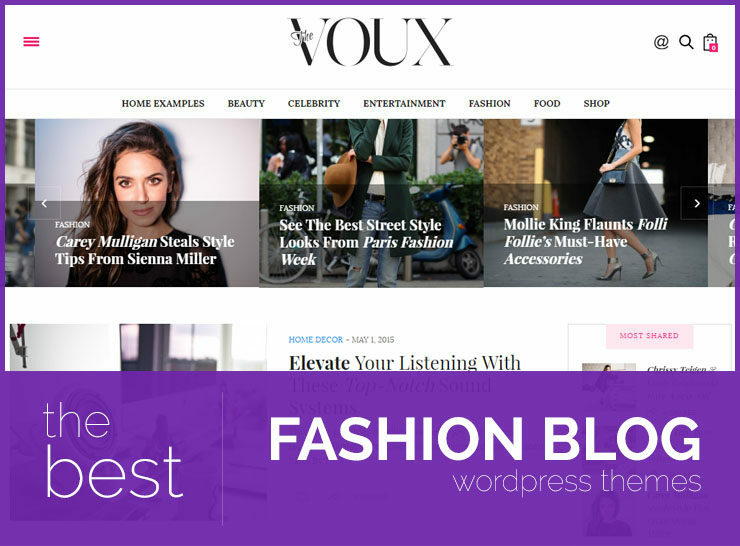 Voux is extremely flexible and is suitable for all types of blogging needs, be it food or personal blogging, health and nutrition tips, parenting magazines, tech or DIY blogging, news magazines, and fashion or lifestyle blogs, Voux has a layout for all. With up to 9 pre built demos to choose from, Voux allows you to set up a unique layout without writing a single line of code. The Visual Composer integration gives you flexibility and plenty of options to play around with. The theme is responsive and compatible with widgets for Facebook, Pinterest and Instagram. There are sidebar widgets for posting tags, recent pins and most shared pins. Another attractive feature is the video widget that allows the user to view a list of all videos within one area. It is compatible with top WordPress plugins like Jetpack and MailChimp. Moreover, if you’re a food blogger with a penchant to sell things, like your own books, hand made items, etc. 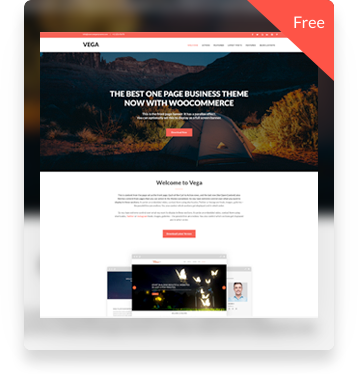 you can setup a shop right into your theme through the WooCommerce plugin. Overall, Voux is a well thought out and carefully crafted blogging theme that is one of the best food blog themes that you can choose from.